On the coldest, wettest opening day of trout season in reliable memory, I had a full stringer of trout by mid-morning while my fishing companions had only cold thumbs hanging from their stiff wader belts. Admittedly, I hadn’t caught the trout quickly or easily. Indeed, having to contend with the elements while covering a considerable length of stream, I felt the fishing had been tough. But I had caught my Pennsylvania limit of five trout, kept three, and then caught and released a half-dozen more. The wind blew from the north; the wet snow splattered my face. Still, I caught fish. It was not that my technical skills were any better than those of the other anglers. Instead, I attributed my success to the bait. Two days before, I had gone to a local unstocked stream and seined more than two dozen minnows, darters and sculpins. I had kept these baitfish lively in a large, well-aerated aquarium outside in the tool shed where the water temperature stayed nice and cool. As I gathered my equipment for opening day, I placed the minnows in a foam bucket with a couple of refrigerator ice cubes. After parking by the stream and engaging in some friendly greetings, I took a small metal pail, the oval kind worn with a strap around a shoulder, and walked over to the trout stream. I took the water temperature—43 Fahrenheit—and filled the pail. Back at the truck, I checked the temperature in the minnow bucket—42 degrees—and confidently transferred my precious bait into the pail I would use on the stream. None of the minnows showed any ill effects from this transfer nor did they look distressed when I lowered the metal pail with its lid holes into the stream. I had taken pains to avoid stressing the baitfish, and when I impaled the first minnow on a small, sharp hook and dropped it into the flow, it’s liveliness showed that my efforts had been worthwhile. Nearly every one of those baitfish, from the cutlips minnows to the mottled darters and sculpins, drew a strike. These particular trout had been stocked nearly a month prior to opening day, so I knew they had already seen natural bait the likes of which I was now presenting. My less-successful friends were instead using a mix of store-bought baits. Three days later, when the weather took a turn for the better, my friends with their grab bag of baits and their seats on the bank did as well, or better, than me. That day, I had a tougher time fooling the fish because my presentation required I wade in their home waters. And that morning the sun was shining brightly and the air was still as a dead battery. The trout, which had been harassed for several days, saw me coming. On opening day, I enjoyed the superiority of stream-caught bait. Later, I got the refresher course in why no one bait is best for all trout. It pays to use different baits under different conditions. A natural bait that I often rely on when fishing calm water or pressured fish is the old reliable mealworm and the newer import, the butterworm. Both of these soft-bodied larvae are superb trout baits, and to me, the reasons for their appeal seem obvious. When threaded on a hook, both exude juices from their soft innards. This fluid spreads out in the water, appealing to the trout’s sense of scent and taste. Also, the creamy white color is right in line with what a trout expects in natural food of this ilk. Finally, the larva wiggles ever so slightly on a hook, and there is good reason to believe that trout react to this subtle motion. Combine those attributes, and probably more that are indiscernible to human senses, and you have a terrific trout bait. I also believe that mealworms and butterworms have their time and place, same as native minnows in cold water. When fishing a fast flow where any bait is whisked away on the current, I don’t particularly care for this subtle offering, nor when working a stream with sizable boulders. But if I’m fishing in such a way that the bait has the time to settle down in calm water beside a mid-size rock where a trout might be, that is a different matter and probably a good place to present the sluggish larvae. Mealworms, waxworms, butterworms, etc., really shine in still water, places where a bait can lay in one position and let the scent cloud bring in the trout. I like tossing larvae in pools, in the hearts of slow runs with moderate current, and at the start of a tailout, places where an affixed split shot can settle to bottom beside the faster current. Just because the trout may come to a bait doesn’t mean I leave it lying on the bottom. Indeed, if I don’t get a strike within a few minutes, I slowly inch the bait along, though with frequent pauses. The reason for this halting, slow-motion retrieve is twofold. First, the initial landing may have brought the bait down behind a rock or somewhere else that is completely out of sight of the fish. When I move the line for the first time and feel the tension from a snag, I realize I’ve probably been wasting my time. Second, inching a bait along not only shows it to more fish, the bait’s “sudden” appearance in new water may also solicit a reaction strike. I consider the proper storage of insect larvae just as important as the proper keeping of minnows. Waxworms and butterworms seem to do best between 50 and 60 degrees. This may be as easy as keeping them in an unheated basement, shed or laundry room. You don’t want them chilled, but you don’t want them maturing in the heat of a furnace, either. While on the stream fishing, I keep them in a Lindy Grub Getter with sift holes, placing the plastic container in the outer layer of my clothing or inside if the weather is cold. For spikes and mousies, which I present on tiny, curved caddis hooks, the best storage temperature is the upper 30s. I keep these in my refrigerator’s vegetable crisper. The best place depends on how cold you keep your fridge. Also, all larvae keep best in sawdust, which I gather from my wood pile. But do not store them in sawdust from sawing pressure-treated wood or plywood. The same places I toss insect larvae I also present what I call grocery-store baits: canned corn, mini-marshmallows, cheese and whatever else. I also include the jarred salmon eggs and moldable putty baits in this grab-bag category. Natural salmon eggs seem to have gone out of favor with trout anglers, yet I still use them with great confidence and success. The great thing about salmon eggs is that they work equally well in clear or cloudy water, high or low water. However, I have borrowed a page from the colorful putty baits and applied it to salmon egg presentations. I thread two and sometimes three different colors of salmon egg on a single hook that is a little larger than the one usually used for a delicate single-egg presentation. I haven’t noted any preferred combination of colors, but combinations that include fluorescent orange, red, peach, natural salmon and white eggs all catch trout. If you collect, cure and store your own eggs (taken from the salmon you catch in the fall), you can make a wider array of colors than is commonly available at the bait stores. The “oil” that exudes from natural salmon eggs attracts trout, and for the most part, simply skewering an egg on a hook is enough to release this inviting scent. But in the event the egg is a little dry or maybe just tough-skinned, be sure to scramble it enough so that it emits the oil while still remaining on the hook. Salmon eggs are most effective sitting still or presented with only subtle fidgeting. I like to present salmon eggs and rounded putty baits in an off-current eddy or behind a rock in mild current. I want it to stay put and not drift away, but I also want it to move around a little in light current. To accomplish this, I use a leader no heavier than 4-pound test with enough leader between the hook and either a split shot or a tiny egg sinker. The idea is for the weight to stay anchored while the bait casually circulates on the leader. Night crawlers, garden worms and redworms are universal trout baits, good in many situations and conditions. They really stand out in slow flows as the water temperature tops 50 degrees. Chilled worms in water that is less than 45 degrees just don’t attract trout the same way. Many a cold opening day I have watched anglers dunk worms and not do a heck of a lot. Yet a few weeks later, in climbing water temperatures, trout vigorously nip at the livelier worms. 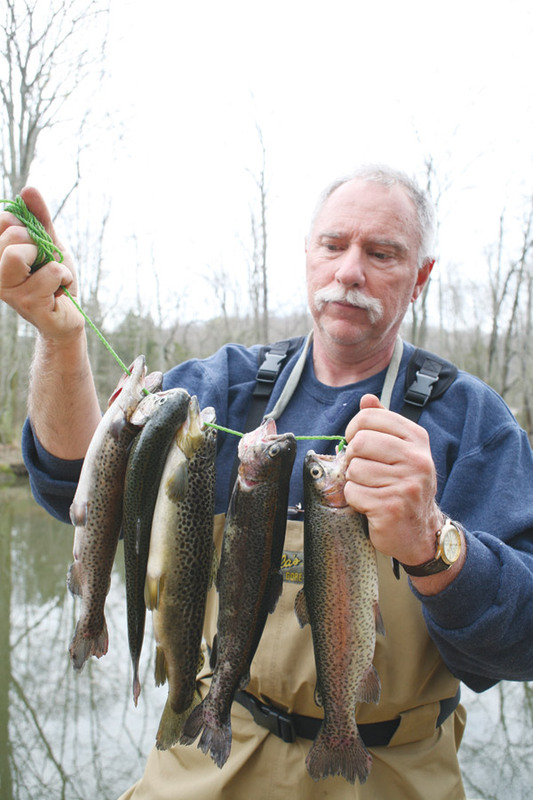 Make the effort to match baits to the weather and the water being fished, and you almost always improve your chances with early season trout.